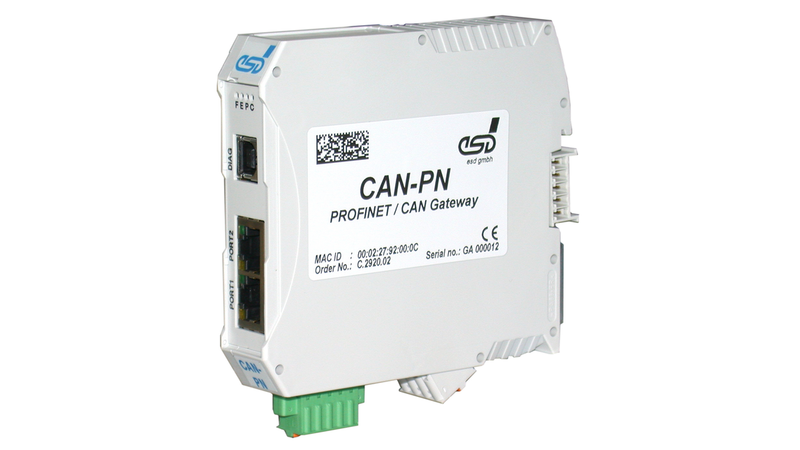 The module CAN-PN can link any PROFINET-IO controller to a CAN network. The CAN-PN gateway itself operates as a PROFINET IO device with a maximum of 1440 bytes input data and 1440 bytes output data on the PROFINET bus. (CiA DS 301) or layer-2 (ISO 11898-1) applications to e.g. a SIMATIC-S7. The number of CAN participants is not limited by the gateway. The CAN high speed (ISO 11898-2) compatible interface allows a maximum data-transfer rate of 1 Mbit/s. The 100 BASE-TX PROFINET interface is compatibel to IEEE802.3 and runs with 100 Mbit/s. The PROFINET as well as the CAN interface are electrically isolated. The module can be configured via PROFINET configuration tool, e.g. the PLC SIMATIC Manager. No additional configuration tools are required!